Photo (Above): Drake’s Estero, Point Reyes National Seashore by Julio Duffoo. Kevin and Nancy Lunny are third-generation cattle ranchers who decided to buy their neighbors’ oyster farm when the neighbors retired. The farm is in Point Reyes National Seashore and their landlords have become disenchanted with the aquacultural residents. The debate has enthralled Marin County and is front page news. There are two sides, as most debates are constructed. This is one side, the meat side. What made you want to become oyster farmers? NANCY LUNNY: When we adopted triplets in 1988, we decided there’s no way this little beef ranch could support my in-laws and our whole family. How long have oysters been in Drake’s Estero? 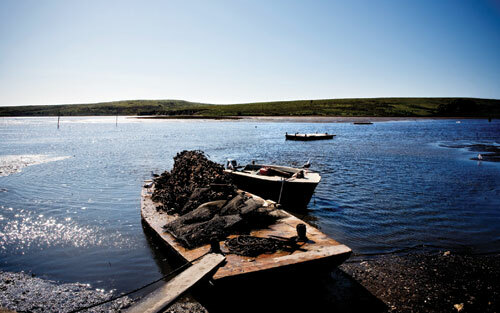 NL: Oysters have been harvested in the Estero for at least 80 years commercially, and before that the Coastal Miwok had been managing the oyster for millennia. The Native Americans knew there were baby oysters on the shell of an already established oyster. How they knew that is just beyond me. So they would scrape the shell and throw it back in the water. That would manage the population. When the Europeans settled, they didn’t realize you have to replant and so they decimated the native populations. Now everyone farms the Pacific oyster, from Japan, instead of the native Olympia. NL: There are two ways. There’s dredging and there’s the way the Johnsons did it, which is called hanging culture. Less than 5% of the nation’s oysters are grown off-bottom, which is how we do it. It is also much more labor-intensive. It’s a wonderful, environmentally benign way of raising oysters, but it is expensive. Charlie Johnson discovered the technique when he went to Japan to buy oysters. All the oyster farms had a buyer then that would travel to Japan. He adopted it because of the predation problem in the Estero with bat rays. Most oysters grow on the bottom. On the hanging racks, the bat rays can bump into them, but they are protected. Because we’re the state’s last operating cannery, that means we have shells because we’re shucking oysters. We punch a hole in the curved side of the shell, and that basically becomes a placeholder for new oysters to grow on. An oyster starts as a swimming larva, and you can see a white cloud where they are swimming, trying to find a hard substrate to land and grow out the rest of their lives. The larva drops its swimming foot and its cilia, and wherever it lands, that’s where that larva grows its own shell on the placeholder shell. Then you have a cluster of 10-plus oysters, almost like an oyster sculpture. Eighteen months later, you break off the outside ones to sell as singles. anything that’s stuck together goes to the cannery, and that gets opened and put in jars. Maybe 10% are sold in the jars. It’s very labor intensive. But who wants to let go of the last of something? You do it because it means something to a lot of people, even if it’s not the majority of people. There’s an 80-year-old man that comes every Saturday for his oysters that his wife cooks up for him. It’s tradition. KEVIN LUNNY: From a food-producing standpoint, this is totally amazing. There’s no feed, no fertilizer, no fossil fuel use. We would need 30,000–50,000 acres of grassland to produce the same amount of protein we produce in the 1,060-acre estuary. We don’t need fresh water. How many oysters do you harvest every day? KL: On a busy day, usually before a holiday weekend, we’ll do 100,000 oysters. The coolest thing about shellfish is that, say we harvest 100,000 oysters and we put them in the walk-in, and then if we only sell half that, we can put them right back in the water and they start pumping away and they’re happy as can be. It gives us a lot of flexibility. Tell me about your conflict with the Park Service. KL: This is an overwhelming issue in our lives. We are farming oysters in the middle of the pastoral zone of the Point Reyes National Seashore. In 2012, our lease is up for renewal, and there is a small faction in the Park Service who don’t want us in the Seashore. Twenty percent of Marin County’s income is from agriculture in the National Seashore. Drake’s Estero has been California’s largest shellfish production for most of the last 100 years, and we produce 40% of the state’s oysters. In 1976, Congress passed the Point Reyes Wilderness Act recognizing Drake’s Estero as “potential wilderness” because of its ecological values. Now the park is looking at that document and saying the oyster farm must go. The park said we were doing catastrophic damage to the sediment, the fish composition and density, the eel grass, and most profoundly, that we had caused an 80% decline in the harbor seal population. We were horrified. Our Marin County Board of Supervisors saw the debate going on, and they offered to do a scientific review. The park wouldn’t allow it. So Marin County asked a resident who is president of the Life Sciences Board of the National Academy of Sciences to look at their data and see if it supported their claims. He did it as a favor. He said they don’t have any data to support the claims, and when I ask them for more data, they won’t give it to us. He said he had never met a scientist who won’t give you data. Senator Dianne Feinstein, top staff at the Department of Fish and Game, top staff at the Coastal Commission, the director and deputy director of the Park Service, the inspector general of the Department of the Interior, Secretary of the Interior, Ken Salazar, and the Marine Mammal Center have all been involved in a decision-making process that has yet to yield a decision. KL: It has cost us a small fortune in legal and consulting fees. It’s rocking DC because policy goals are driving science instead of good science driving policy. We want to put this behind us. The report will be out in June. And we have no idea what the Interior is going to do. We are going to keep planting. If we don’t, we’re writing our own death certificate. Agriculture and environment are not mutually exclusive. They can work beautifully together and they have for millennia. That’s the Reader’s Digest version; it would take three weeks to tell you the whole thing. Oysters have been harvested in the Estero for at least 80 years commercially, and before that, the Coastal Miwok had been managing the oyster for millennia. JULIO DUFFOO was born in Peru, was raised in Brooklyn, and is now based in San Francisco. He has photographed people who spend their lives engaged with meat for every issue of Meatpaper since Issue One.